Go to Administration and from Look & Feel - Presentation change the value for "Show Page Annotations" from "No" to "Yes" or default. Also the content's "More Actions" submenu will display an Annotation entry, but the icon is missing for this enty. 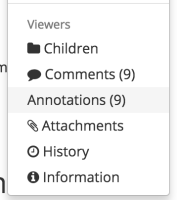 Make sure the Annotations entry has an icon. For FA we could use "thumb-tack" or "sticky-note", see the proposal images. If they don't already exists, add the icon mapping in the Icon Theme mapping.